Once a client has completed an assessment, the MindFlex service then scores those responses, standardizes them in comparison to the responses of thousands of other respondents, and creates a MindFlex profile that graphically depicts the client's results on 21 dimensions of functioning. Thus, the MindFlex system offers clinicians and therapists a simple, convenient, straightforward method of assessing the strengths and challenges that their clients bring into therapy and for tracking change over the course of treatment. Click here for a sample profile. ACCEPTANCE: This Multidimensional Psychological Flexibility Inventory (MPFI; Rolffs, Rogge, & Wilson, 2016) dimension assesses the degree to which individuals open themselves to difficult thoughts and feelings, allowing themselves to observe and experience them without pushing them away. PRESENT MOMENT AWARENESS: This MPFI dimension assesses the degree to which individuals remain attentive and aware of their thoughts and feelings throughout their daily lives. SELF AS CONTEXT: This MPFI dimension assesses the degree to which individuals are able to see the larger picture and maintain a broader perspective, even in tough moments when life knocks them down. DEFUSION: This MPFI dimension assesses the degree to which individuals to gently experience difficult feelings, allowing them to pass through without clinging to them or getting caught up in them. CONTACT WITH VALUES: This MPFI dimension assesses the degree to which individuals stick to their deeper priorities, ensuring that those deeper values give direction to their daily lives even when that means making tough choices. COMMITTED ACTION: This MPFI dimension assesses the degree to which individuals are able to continue taking steps toward the things in life that are important to them, even when life gets stressful or when they are faced with setbacks. GLOBAL FLEXIBILITY: This MPFI composite combines all 6 flexibility dimensions of the hexaflex model into a single index. VITALITY / ENERGY: This Mindflex scale assesses the degree to which individuals feel alive, energetic, happy, enthusiastic and vital. SENSE OF OWN COMPENTENCY: This Basic Psychological Need Satisfaction & Frustration Scale (BPNSFS; Chen et al., 2015) subscale assesses the degree to which individuals feel confident and capable at the things they do and competent to achieve their goals. SENSE OF CONNECTION WITH OTHERS: This BPNSFS subscale assesses the degree to which individuals feel close and connected to the people in their lives. SENSE OF AUTONOMY: This BPNSFS subscale assesses the degree to which individuals feel that they have control over their own lives and the freedom to make choices and decisions that represent who they really are. LIFE SATISFACTION: The Satisfaction with Life Scale (SWLS; Diener et al., 1985) assesses the degree to which individuals feel that the conditions of their lives are excellent, their lives are close to ideal, and that they have gotten the important things that they want in life. EXPERIENTIAL AVOIDANCE: This MPFI dimension assesses the degree to which individuals actively try to distract themselves from unpleasant memories, thoughts and feelings, striving to avoid them and put them out of their minds. LACK OF CONTACT WITH PRESENT MOMENT: This MPFI dimension assesses the degree to which individuals go through their daily lives on “automatic”, mindlessly floating through life and going through the motions without paying much attention. SELF AS CONTENT: This MPFI dimension assesses the degree to which individuals view their own emotions as bad or inappropriate, criticizing themselves for negative thoughts and feelings and telling themselves they shouldn’t be thinking or feeling that way. FUSION: This MPFI dimension assesses the degree to which individuals tend to get trapped into negative thoughts or feelings, finding them spinning around in their minds like broken records making it very hard to see past them. LACK OF CONTACT WITH VALUES: This MPFI dimension assesses the degree to which individuals allow the things they value most in life to fall by the wayside when life gets hectic, sometimes even dropping off of their priority lists completely on a day to day basis. INACTION: This MPFI dimension assesses the degree to which individuals get easily derailed by negative feelings and experiences, stalling out their plans, losing track of what is really important to them, and becoming stuck and inactive. GLOBAL INFLEXIBILITY: This MPFI composite combines all 6 inflexibility dimensions of the hexaflex model into a single index. 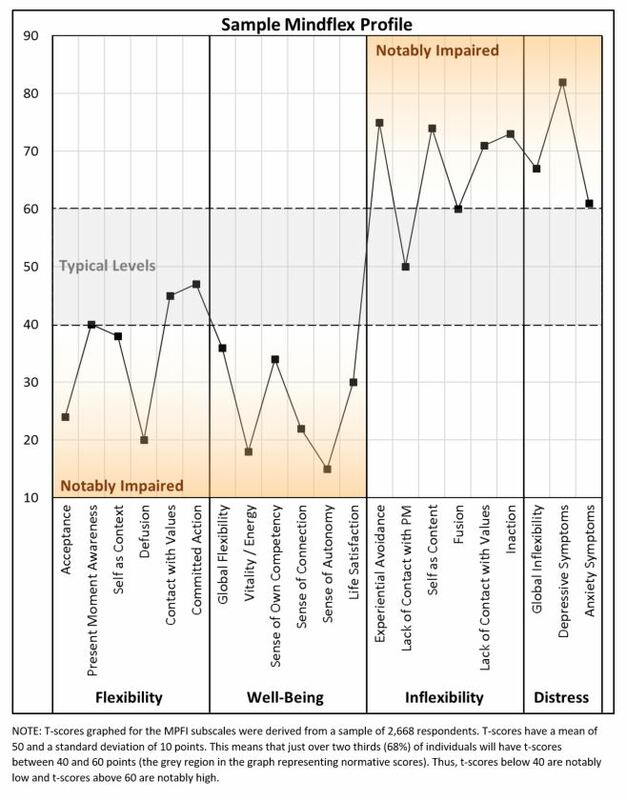 DEPRESSIVE SYMPTOMS: The Patient Health Questionnaire (PHQ-9; Spitzer et al., 1999) assesses the level of depressive symptoms individuals have been experiencing over the last 2 weeks. ANXIETY SYMPTOMS: The Generalized Anxiety Disorder 7-item (GAD-7; Spitzer et al., 2006) assesses the level of anxiety symptoms individuals have been experiencing over the last 2 weeks.